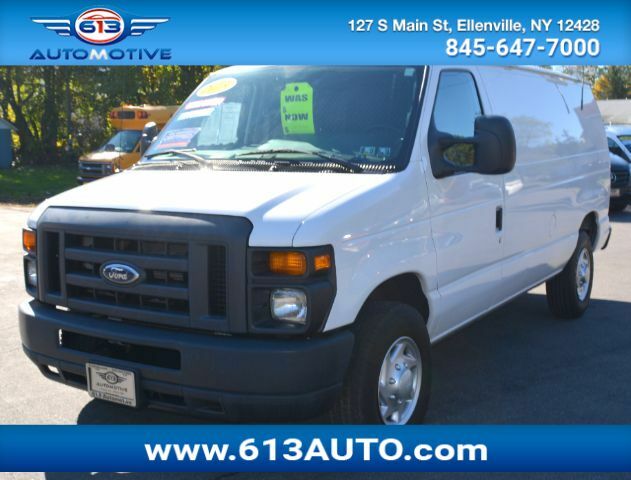 One look at our pictures and you will have no trouble recognizing our 2013 Ford E-Series Van. This E-250 on display in White has one sole purpose: to tote a lot of stuff from point A to point B with absolute expertise. The power plant for this beast of burden is a 4.6 Liter V8 that, under the management of its 4 Speed Automatic transmission, puts out 225hp and 286 lb-ft of torque. This match-up is good to tow 6,500 pounds with the proper equipment. Our E-250 has plenty of reasons why it would be perfect for you, including a history of solid performance, impressive hauling capacities, and a plethora of job-enhancing and convenience options. All of that makes this venerable workhorse worth its weight in two-by-fours, electrical equipment, and plumbing supplies. You''''ll be comfortable in this functional van with comfortable bucket seats, air-conditioning, and a two-speaker AM/FM radio with an auxiliary audio jack. You''''ll be kept safe during your workday with four-wheel anti-lock disc brakes and stability control. If you''''re ready to get to work, go ahead! Print this page and call us Now... We Know You Will Enjoy Your Test Drive Towards Ownership!